Here is a rare beast, an ex Southampton Corporation Thornycroft Daring. It was one of 9 such vehicles they bought, in penny numbers, between 1933 and 1937. They were all withdrawn in 1946 and sold. No.9 went to Safeway of London and, in the critical vehicle shortage days post-war, around 1949, it was pressed into service with London Transport. Note the LT roundel (on the radiator) that all such hired vehicles carried. 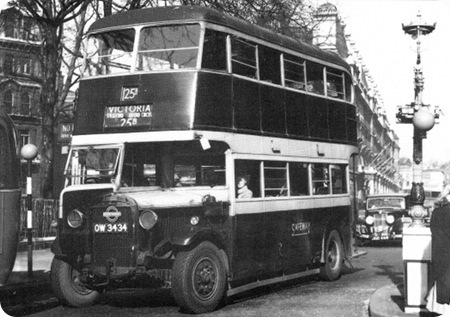 I should add that it was very rare for London Transport to hire double deckers. The bus looks fairly presentable for one with an expected design life of 10 years, yet now 16 years of age, including the trials and tribulations of wartime minimal maintenance, even neglect. And there’s even a shine to the bodywork, which shows no signs of sag. Sad to say, it was not preserved. Thornycroft buses were not that common – Southampton Corporation probably bought them because the company had factories in Southampton and Basingstoke. Incidentally, the car following the bus is a Triumph Renown. Thornycroft Darings were very rare, SHMD Joint Board having the biggest fleet with just sixteen. Sadly, bus design was advancing so fast in the 1930s that Thornycroft were always just a bit "off the pace" being set by the technological leaders Leyland, AEC and Daimler. The SHMD buses all had Gardner 6LWs, and Southampton’s last four 5LWs, but some had Thornycroft’s own petrol or (not very good) diesel. By all accounts the light chassis and big engine in the Joint Board buses made them very quick on hills, if noisy! The SHMD buses also ran for sixteen years, and some were sold for non-psv use, so they were pretty tough. As far as I can trace, only one Daring survives, and that is a shortened instructional chassis in a museum in Sydney, the remains of a lonely export model! It’s true that SHMD was a large buyer of Thornycroft buses – I’ve counted some 104 of various models between 1925 and 1936. There were a total of 13 Darings spread over 1933, 1935 and 1936, all with Gardner 6LW engines. The very last one to survive did not go until 1959! Maybe it was a ‘learner’. The unusual thing about some 1925 Thorneycrofts was that they had Vickers bodies. I never knew that Vickers built bus bodies; one always thinks that aircraft was their forté! 147 & 148 were actually delivered with Thornycroft diesels, but SHMD knew a lemon when they saw one, and quickly swapped them for 6LWs. Vickers built a good many bodies in the early/middle twenties, particularly on Thornycroft chassis; many were supplied to the GWR. The probable explanation is that at that period, bus chassis builders normally offered their products complete with a standard body which was sub-contracted to anybody with the spare capacity to take on the work at the time. Thus many Leyland TD1s with the standard Leyland body were actually built by Northern Counties and others to Leyland drawings. In later years this practice died out, mainly because operators had more idea of what they wanted and laid down more exacting specifications rather than just accepting what was offered. Thornycrofts would have been on close terms with Vickers through the warship side of their business, as Vickers would have supplied most of the guns fitted to Thornycroft-built destroyers, so they were perhaps the obvious people to ask when bodies were needed. Vickers in turn would be desperate for work with the collapse of War Office orders for tanks, guns and aircraft at the end of the Great War. 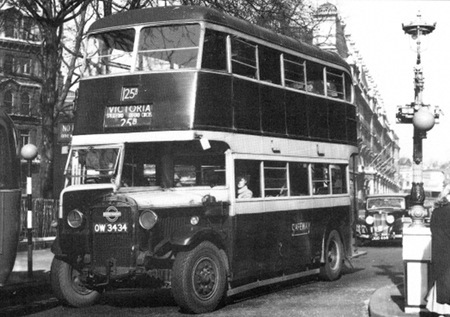 Metropolitan Vickers supplied steel body frames to Manchester Corporation as late as 1933, but like many other early attempts at steel framing they very rot-prone and the vehicles concerned were rebodied sooner than should have been necessary. That seems to have been the end of Vickers attempts to build bus bodies. I defer to you, David, on numbers! I assume that neither you nor anyone else has a photo of several of these Darings together! As far as I know the record for a picture of Darings is the photo taken at Northern Counties in 1935, which shows all that year’s batch for SHMD; sadly they’re not finished, let alone painted! SHMD Darings do seem to have been very camera-shy! Referring to Dave Jones` comment about Leyland, I always had the impression, due to similarities of design, that many Leyland bodies in the late 30s and 40s were built by Alexanders and Park Royal. Indeed Jim, that’s true, and a good number of early postwar PD1 Titans had bodies contracted out to Alexander, Samlesbury and even one, in Samuel Ledgard’s batch of six in 1946, Lancashire Aviation – despite its aeronautical origin however, the latter was no more spritely than the other five !! I’m a bit surprised to find that there is no reference in the list to the left of either Hants & Dorset or Wilts & Dorset. Whatever has this to do with a Thornycroft bus? Well, The Red & White group – which is listed – had as a subsidiary Venture of Basingstoke. It was passed to Wilts & Dorset at Nationalisation. There’s a chapter on Venture in "The Definitive History Of Wilts & Dorset 1915 – 1972" (by Colin Morris and Andrew Waller). It seems that it was established as a means of getting staff home and back to the factory in their lunch break, hence a "venture" on the part of the company management. Mrs Thornycroft (JI’s daughter in law) is cited as being the inspiration. Vickers of Crayford were one of the biggest builders of bus bodies in the 1920s, and they, also, produced the standard TD1 body for Leyland, the batches for Bradford being examples of this. Southampton Corporation had many J type Thornycrofts in the 1920s, and also a batch of 6 wheel double deckers with English Electric bodies about 1929, so their small numbers of Darings were perhaps just a token order bearing in mind the earlier close relationship. SCT, in that period, were perhaps equally well known for contemporary purchases of Guy Arab models, with both composite, and metal framed Park Royal bodies, but they settled down after the 1936 orders, with the good old Leyland Titan, reverting to Arabs in the post war era. Nottingham City Transport bought four Thorneycroft Darings with Gardner 5LW engines from Southampton in 1947. The four were OW 9932, AOW 263, AOW 264, AOW 265. The NCT fleet numbers were 122 to 125 and the Southampton fleet numbers 6 and 60 to 62. These buses didn’t last long with NCT as all had been withdrawn and sold by 1949. Vickers built PSV bodies and railway carriages in the 1920s in factories at Crayford Surrey and in Nottingham. The works manager at Crayford in 1924 was Bill Black who was later Chairman of Leyland Motor Corporation. Metropolitan Viockers and Cammell Laird later merged their coachbuilding interests to form Metro-Cammell, based in Birmingham, who worked very closely and later took over Weymann of Addlestone. Alexander built bodies to Leyland pattern from 1942 to 1948 or so. If you want a good idea of how a Leyland Utility would have looked, an Alexander TD4 rebuild would give a good idea. Park Royal did not build to Leyland Outlines in the 1940s but other firms that did were Lancaster Aircraft Corporation and Samlesbury Engineering. Massey Brothers built to the original Leyland steel reinforced Hardwood pattern into the late 1930s customers including Wigan Corporation and J. Fishwick & Sons. When I was at Clifton College Bristol Preparatory School in the 1950’s we would be driven to our sports fields across Clifton Suspension Bridge in one of two Thorneycroft buses. They were impressively ancient, the driver sat outside with only a sort of porch roof to cover him. I remember a large fly off hand brake, a bulb horn and spoke wheels. I wonder what happened to these buses and whether anyone has a photograph of them with their College livery on their sides? As a very belated postscript to the discussion on Vickers bodies, I recently discovered why Vickers stopped building bus bodies -sort of. In the mid-thirties they bought a major share in Metro-Cammell, having obviously decided that it was just easier to buy in the expertise than to struggle on alone. It’s all rather reminiscent of the way they bought Supermarines out to get hold of R J Mitchell, if rather less glamorous!